Our commitment to giving back to the community began with a 2009 initiative to serve, encourage or support people around us. We recognize the importance of community and the responsibility we have to use our resources to benefit others. ASBA is proud to have held a Thanksgiving giveaway at the Kennedy Krieger Institute in Baltimore for many years. 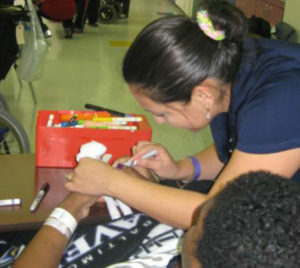 ASBA staff donate gifts to hospitalized children and takes time to participate in games and activities with them. Giving to Kennedy Krieger continues to be an uplifting opportunity for us and for the children, we look forward to continuing our Thanksgiving visits in the future. Since 2004, the non-profit organization HBCU Career Development Marketplace, Inc. has offered soon-to-be grads from historically black colleges and universities this free event to aid them in the transition into the workforce in corporate America. This annual conference gives students the opportunity to attend a series of workshops, meet potential employers, speak with successful HBCU alumni and network with fellow HBCU students. ASBA has donated their services and over one hundred thousand dollars to the HBCU Career Development Marketplace, Inc.
ASBA sponsored a cyclist for Tour du Rouge – a six day, 526 mile fundraising adventure along the Gulf Coast. The tour is held in support of the American Red Cross Chapters along the Gulf Coast from Houston to New Orleans.